Before Minister Phillips delivered his Sermon, Pastor Qunintin P. Woods addressed the congregation, reminding us all that Young People are the future of the church. 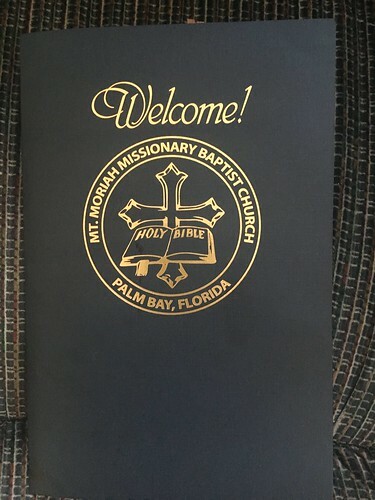 Receiving a Welcome Packet was something I didn't expect. Inside, there was a Visitor name badge with a peel off liner which could be worn during the service so everyone would know my name. Though, I neglected to wear it and decided to introduce myself, I thought it was a pretty practical inclusion. Here is a look at the contents of the packet. The Welcome Packet even contained Dr. Quintin P. Woods Business Card! I was even given The Second Quarter Newsletter which was released recently to members. It is full of Health Tips on protecting ourselves from the Zika Virus, tips for teens and future leaders and it even included a recipe. 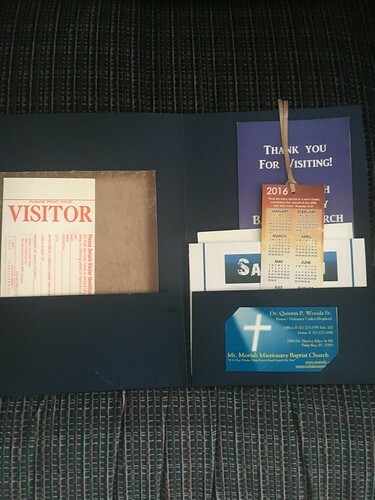 My Welcome Experience at Mount Moriah Missionary Baptist Church was extraordinary. You can visit Mount Moriah's Website for more information on the Church and upcoming events. That's all.